It began innocently enough with dinosaurs. Kids love dinosaurs. I loved dinosaurs. Hell, I still love dinosaurs, so why wouldn’t I share them with my daughter? Girls can be archeologists too after all, and this was the perfect setup to watching Indiana Jones a few years down the line. Except that to my daughter, who was four at the time, dinosaurs weren’t exotic reptilian wonders from 100 million years ago, they were 20 foot tall monsters with teeth like steak knives. Initial wonder gave way to horror, which spawned nightmares about being chased by velociraptors. The eyes grow wide. A new kind of horror sets in. Uh-oh. We’ve gone from hypothetical kid-eating dinosaurs to much less hypothetical and far more real giant rocks in space. That occasionally hit the Earth. Which, as the Tick once said, is where she keeps her stuff. Now we have new nightmares about the Earth being destroyed by meteorites, which then gives rise to lengthy conversations explaining how a) there was a lot more space junk floating around a few million years ago, b) we now have astronomers looking for dangerous comets and asteroids and c) unlike the dinosaurs, we can do something about incoming planet-killers. In theory. But that’s a fine theory, and we’re sticking with it. Never you mind that comet impact in Siberia back in the 20th century. All of which is well and good, and works just fine until August rolls around, and we decide to go see the Persiod meteor shower … in which tiny bits of rock hit the earth. And she refuses to go outside because she thinks she’s going to get hit by meteorite. It worked itself out in the end. Three years later she’s no longer scared of dinosaurs (though the fossils at the American Museum of Natural History in New York gave her pause), we haven’t had a conversation about earth-destroying meteors in months, and she loves to read books about space and astronomy. 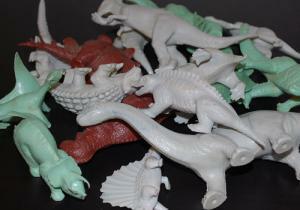 Today, my almost-four-year-old son and I were playing with plastic dinosaurs and he asked me if the dinosaurs went extinct. I said yes … and left it at that. We can talk about meteors when he’s seven.